Pythagoras was born on the Greek island of Samos, which made him a Samian. By the way, another bright man born on this island was Aristarchus of Samos. But we are 200 years ahead of ourselves. Back to Pythagoras. Pythagoras' strong suit was mathematics and philosophy. He went to Crotone in southern Italy and started his own learning center. 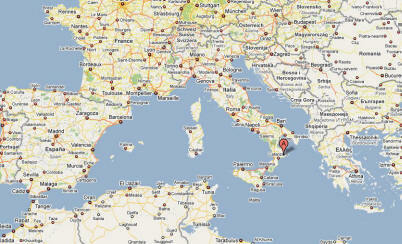 And here you can find Crotone, Italy, on the Google map (see red marker). What is the Theorem of Pythagoras? In other words, the sum of the squares on the legs of a right triangle is equal to the square of the hypotenuse. Algebra is our friend. Euclid agreed and proofed the theorem right by means of his windmill, you know it as Euclid's Windmill. First of all, pythagoreanism is a wonderful word. Try to weave it into your conversation today. Secondly, it was the big P's spiritual inheritance; so much more than algebraic formulae, but rather a form of religion. Transmigration of the soul, astronomy, mathematics in music, numbers in everything, vegetarianism, and much more were covered in the teacher's outline. And of course there were disciples, the Pythagoreans. There was another Pythagoras, a sculptor, who was born roughly around the time of the death of the philosopher Pythagoras of Samos.